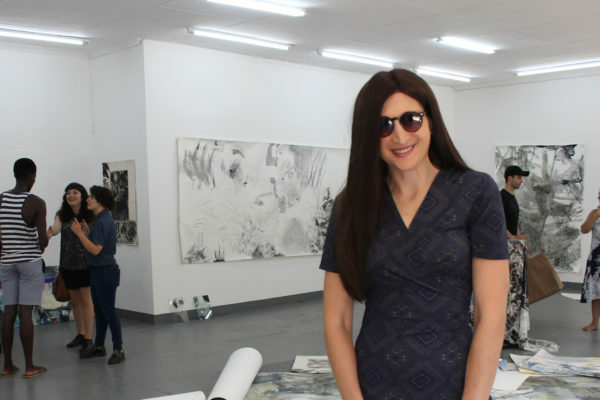 Re-orientating the Mind’s Body is an exhibition showcasing the work of Alexandra Makhlouf, a Wits fine art masters student who has a visual impairment. The exhibition takes place at Victoria Yards until March, 27 and is centred on finding a place in a disorientated world. “It feels important to regain some sense of authorship in an environment that hasn’t become less visual just because I have,” said Makhlouf. The master’s student told Wits Vuvuzela she wanted to explore “visuality through the backdoor”. “I was finding my feet whilst looking for another visual language,” said Makhlouf. Her work is inspired by by three scholars from around the world: Georgina Kleege, an academic who focuses on how art is an accessible language to those with visual disability and Sara Ahmed, a British-Australian scholar, who looks at creating a space where the “lost” and “unfamiliar” become an acceptable identity. Psychology of Perception lecturer in Milan, Riccardo Manzotti, who discusses how external objects are an extension of the internal self also inspired Makhlouf’s techniques. A central technique she felt linked to Manzotti’s theory was egg tempera, which involves mixing pigment with egg yolk to create a fast-drying paint. “I am looking for this organic extension,” said, Makhlouf, “in an effort to connect the work in the paper to the outside in a tangible way”. Other techniques and mediums used by Makhlouf include charcoal, monoprinting and striking dashes of acrylic colour. Artist and supervisor, Jessica Webster, said that Makhlouf’s ability to draw on theory was heightened by her own experiences. “The fact that she did have vision before, puts her in a dynamic position to comment on both states. “The way in which she has constructed the exhibition, the viewer can also get lost in her that space,” said Webster. Morena Motsiri, a BA Geography Honours student said that the exhibition had a “very creative use of space”, where the sculpture in the middle and the draped paintings were “unconventional”.